Delay, someone told me recently, is the enemy of action. And the lack of action is the enemy of raising funds. This seems so obvious, and yet too many nonprofits and way too many development directors don’t seem to get the obvious. If I have a pet peeve about consulting, it is the number of clients and prospective clients who don’t get back to me in a timely fashion. I had the same pet peeve when I worked full time for organizations. Then it was my colleagues who peeved me off. For most of my career, I spent much of my time following up. Following up to make sure that something was done; to check that something was received; to find out if a decision was made or a step taken. I sometimes feel that my only purpose in life is to nag. What makes it strange is that I am not a particularly organized person. And, as those who know me will attest, I don’t enjoy process. What I am goal oriented, and my overriding goal is getting things done. Lots of people are like me, but few seem focused on fundraising. Or, perhaps, a more accurate statement would be that few who should be focused on fundraising are focused on getting things done. I wonder if that is an occupational hazard? In a recent workshop, one of the participants noted that she is normally a very get it done person. The exception? Yep. Fundraising. “I just hate it,” she said, but as the executive director of the organization, it is one of her primary responsibilities. What is a reasonable person to do? For starters, change that attitude. And maybe just rid your vocabulary of that word. Instead of thinking “fundraising,” think, “giving donors an opportunity to make an impact.” OK, maybe that’s long. So think “growth.” Think “progress.” Think “improvement.” None of those would conjure up a picture of a grasping someone. Now, I don’t think that fundraising should, either, but I’m a realist—and for too many people, that’s exactly what fundraising connotes. 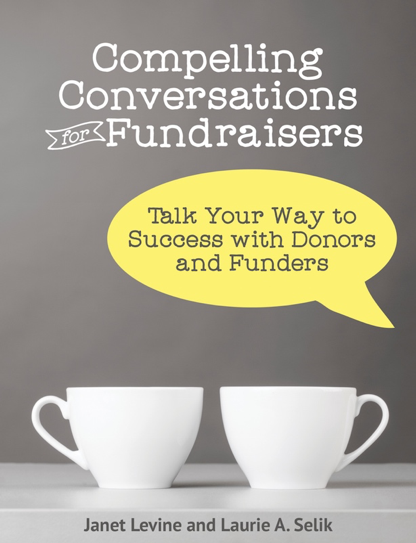 For years the profession has tried to put the focus on something other than fundraising. We’ve tried to replace fundraising with development or advancement, and there is a validity to those terms. We are asking for more than simply funds when we ask someone to join with us in supporting our organization. We are looking to develop a relationship and to advance our cause to greater heights…and yes, to raise funds so we can do the work that is so important. The focus, therefore, should be on what we accomplish or could accomplish because of the generosity and caring of our donors. If we can convey our passion and join it with theirs—and better still, make it “our” passion—fundraising becomes something positive. And instead of delaying so you don’t have to do something you really do not want to do, you are driven to work with those who share your excitement about the work that your organization does and want very much to be a part of it. Janet Levine works with nonprofits and educational organizations, helping them to increase fundraising capacity and build stronger boards. Learn more at http://janetlevineconsulting.com. While there, sign up for the free monthly newsletter. This entry was posted in fundraising and tagged advancement, development, fundraising, Goal-setting. Bookmark the permalink.